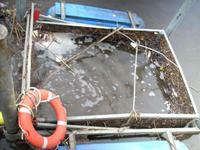 Mersey Basin Campaign Blog: Litter Trap trappings & lifebuoy lost? Litter Trap trappings & lifebuoy lost? There is a new webpage dedicated to posting photographs of the litter trap trappings. I have been amazed at what is turning up - yesterday there was a life buoy in the basket ! If you know where the life buoy has come from, please let me know and I will ask our contractor to keep hold of it when he next empties the basket. Trappings 3rd December 2007 - a lifebuoy, plastic drinks cups and bottles, branches, leaves and a huge bleach bottle (just off the photo).